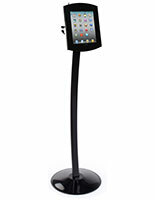 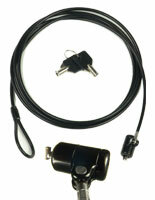 This black iPad floor display comes with a round base measuring 14” across and is a floor standing display. 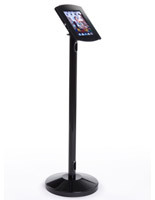 The tablet mounts feature a neutral finish that goes with any setting. 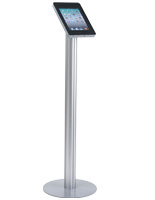 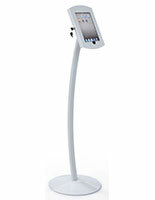 The iPad floor display with fixed height stands 46.5” high and is able to rotate a full 360° for both landscape and portrait formatting of presentations. 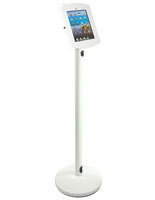 The display for Apple® devices keeps its home button exposed to give customers more surfing options with this tablet mount. 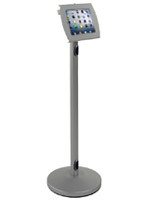 The floor display uses two holes in the post of the kiosk to provide cable management for an organized and professional looking presentation. 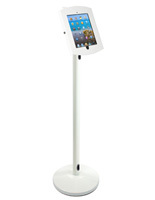 The Apple® touchscreen enclosure is also able to tilt, to offer more and better views of presentations. 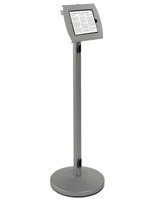 14.0" x 48.0" x 20.0"
9.0" x 11.8" x 0.75"